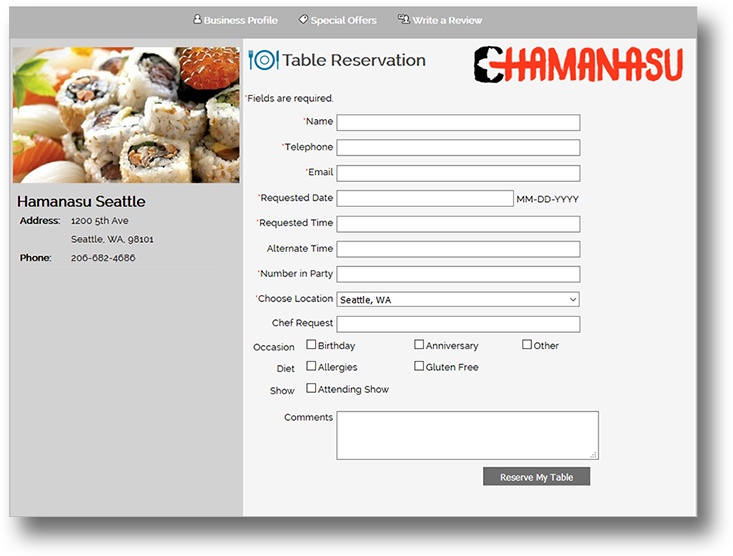 We make it easy for your customers to make a reservation online on your website. Unlike other online reservation services, the reservation system is integrated with your website, there is no need to return to the original source to make the reservation. You will be able to manage all your locations with ease. All the reservations/cancellations will be instantly updated for you to view with the click of a button. With all the statistics readily available to you, you will be in a position to make more informed business decisions based on the reservation trends for different days of the week, weekends, special occasions & festivities. This tool gives your customers a fast easy way to communicate with you about an upcoming special event. Our online tool will send you a clear formatted for with all the information you need to follow up with you customer about their corporate / special occasion catering event. 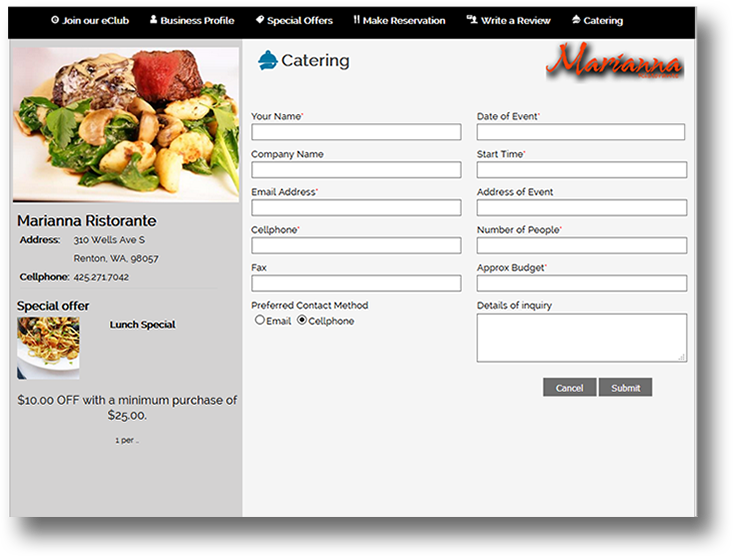 Across the Street Catering application can be seamlessly integrated with your website. Stay up to date on all upcoming catering orders. View the status of specific order, including their scheduled pickup times. Customer profiles include contact information and ordering history. Search for customers by name, email or phone number to ensure orders are correctly filled and on time. Create new offers every day, once a week or monthly. It's easy with our online tool. 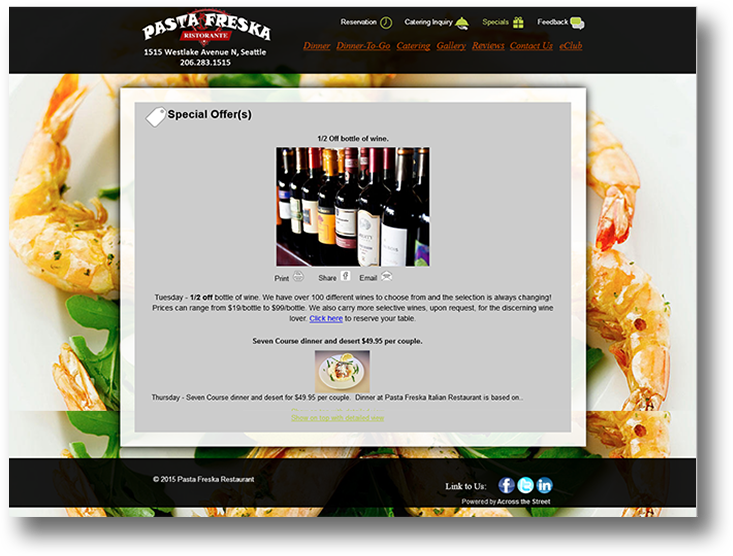 You can provide attractive offers that will drive customers into your restaurant today. Your special offers/deals will get maximum visibility within the relevant audience when you use Across The Street's features listing services. You will get high volume of responses, when you strategize your deals/offers based on market trends for different days of the week, weekends, special occasions & festivities. Customer Feedback is key to a restaurant's success today. We make it so that customers can give you feedback right on their website. With Across The Street, it's a two way communication. 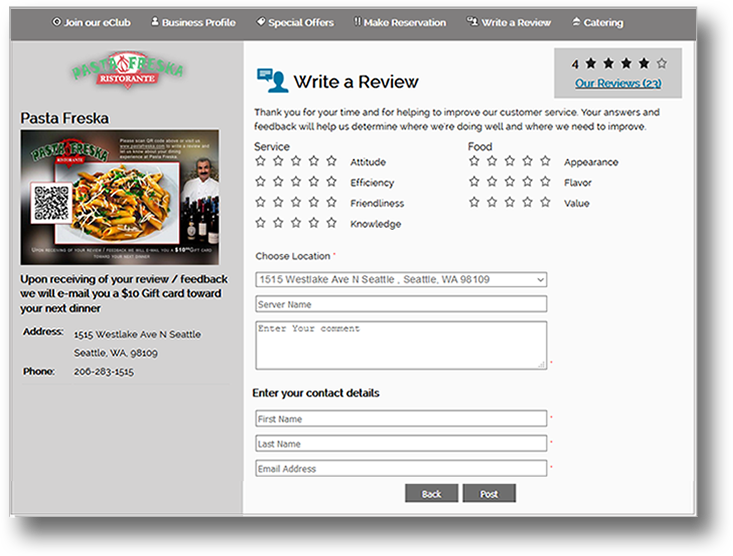 You can review and respond to customer reviews and take action. When you have your ratings & feedback available online, you already are ahead of businesses that don't. You are in control of monitoring feedback. You design your own feedback categories, choose what features get "star" reviews. You can plan your business decisions based on the kind of feedback you receive. It will help you to take corrective action in case of customer dissatisfaction, and find out improvement areas in serving your customers.